The new Nikon AF-S NIKKOR 300mm f/4E PF ED VR, is not just another lens. It utilizes a new technology that allows a sharp, professional level long lens to be hand held and used without a lens collar on a tripod. The fixed focal length telephoto lens, which is marketed as the lightest on the market, is also a good value for professionals and serious enthusiasts at $2,000. It was introduced at CES last month with fanfare. While not yet on the market, the innovative lens is currently available for pre-order. 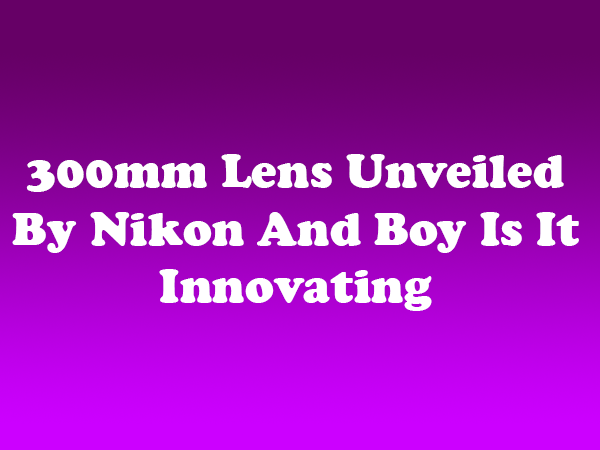 According to Nikon, its latest lens not only weighs approximately 545 g less than its predecessor, but it is approximately 75 mm shorter in total length and its maximum diameter is approximately 1 mm smaller. The key is the new Phase Fresnel (PF) lens element, which also delivers sharp, crisp images. As described by Nikon, PF lenses differ from general interchangeable lenses because the image formation is performed in the order of red (R), green (G), and blue (B) starting with the portion near the lens rather than the order of blue (B), green (G), and red (R). By combining the PF lens with a refractive lens, chromatic aberration can be effectively compensated. Overall, Nikon’s latest lens promises to deliver superior image quality. As detailed above, is also offers something for every photographer, from nature and landscape aficionados to action and sports shooters. For Nikonians eager to add the lens their arsenal, the AF-S NIKKOR 300mm f/4E PF ED VR is currently available for preorder and is expected to ship beginning February 9, 2015.